Preheat oven to 400F. Prepare bell peppers. Cut each pepper in half, remove seeds. Place on sheet pan, spray with cooking spray and bake for 10-15 minutes until peppers have started to soften. Bring 1 cup of water to a boil in a medium saucepan. Add quinoa and cover. Reduce temperature to low, cook quinoa until tender, about 15-20 minutes. In another skillet, heat a drizzle of olive oil, add onion and cook until soften. Add ground beef, breaking apart into pieces, until meat is browned. Add chili powder, garlic powder, onion powder, dried oregano, paprika, cumin and pepper. Cook for 30 seconds until fragrant. Add crushed tomatoes and bring to a simmer. Cook for 10 minutes. Add in quinoa, stir well. Fill each pepper half with quinoa and beef mixture. 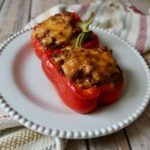 Top each pepper with 1 TBSP cheese. Bake for 15-20 minutes until cheese is melted.